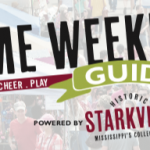 Each fall, on the Wednesday before Mississippi State’s first home football game, hundreds of volunteers take to the streets, parks, and other outdoor areas of Starkville armed with rakes, shovels, and pruning shears. Their goal? Clean up the city and make it especially attractive to the thousands of visitors who will be coming to town for fall football games. Local residents are encouraged to fly the Mississippi State flag and to mow, trim, and do whatever it takes to spruce up their homes and yards. Get Swept Up! is coordinated by the Greater Starkville Development Partnership and sponsored by local businesses. The real work is done by upwards of 500 people who donate their time and energy. They pull weeds, trim shrubberies, pick up trash, and do whatever it takes to make the city look its best. A number of organizations, including garden and civic clubs, take part, too. Make plans to join us this year for Get Swept Up! on Wednesday, August 29, 2018! Volunteers receive a free Get Swept Up! T-shirt plus bottled water, gloves, trash bags, and other supplies needed for their cleanup efforts. To volunteer, contact the GSDP office at (662) 323-3322 for information and assignment to a work location or fill out the online volunteer form. *In order to guarantee specific sizes for volunteer t-shirts, please complete the volunteer form no later than Wednesday, August 8, 2018.